Click here to download the flyer for the Mundaring Arts Centre with more information about this and the Mine Own Executioner exhibition. Joel participated in this joint exhibition of artworks that express the intimate power and beauty of miniature art forms. 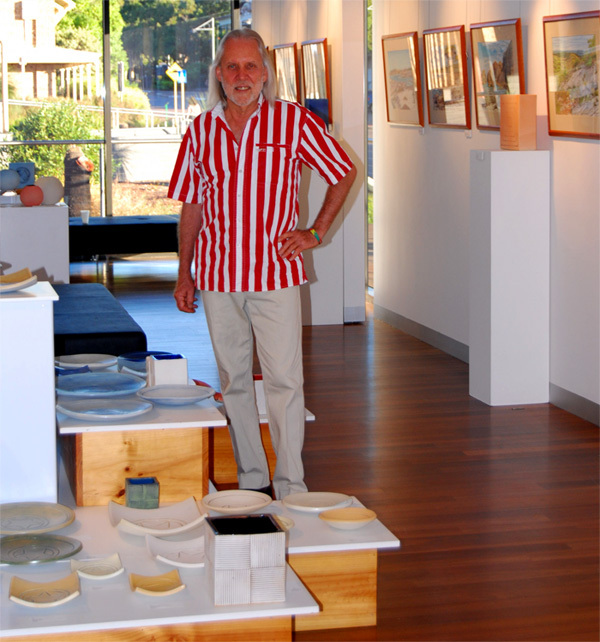 Nine artists from the Shire of Mundaring have banded together to open up their studios to visitors on the last weekend in October. 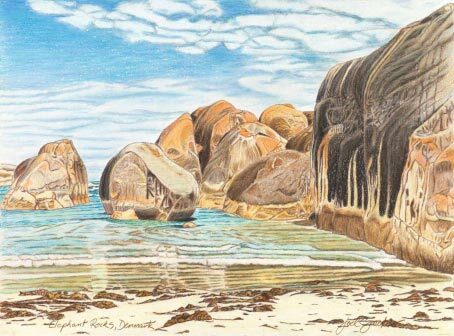 The Hills area east of Perth has long been known as a place where artists and craftspeople choose to live as the semi rural nature of the area provides space and inspiration for their art practice. The public will be able to talk to the artists and see how they go about making their art and buy direct if they wish. 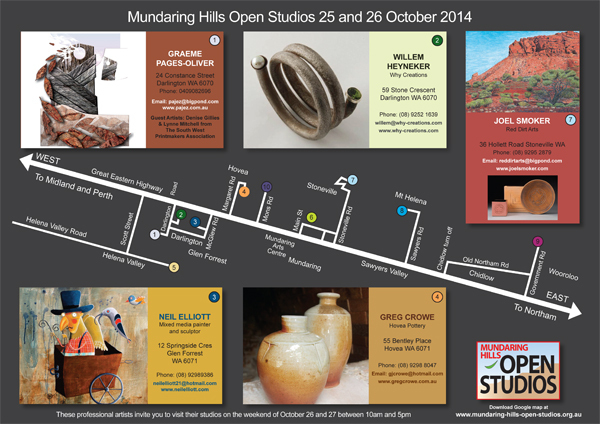 A Mundaring Hills Open Studios map is available for you here and gives clear directions on how to get to the studios where entry is free. The artists and craftspeople involved are Brian Aylward, Madeleine Clear, Greg Crowe, Inta Goddard, Christine Hingston, Jeremy Holton, Judy Kotai, Graeme Pages-Oliver and Joel Smoker. More information can be found here where you will find links to a number of the artists' web sites. Their work can be viewed and purchased at the Mundaring Arts Centre, located in the old post office building in the centre of Mundaring, 7190 Gt Eastern Highway (www.mundaringartscentre.com). The artists'	studio map is also accessible on Google. October is a great time to visit the hills as the wildflowers are in full bloom and the weather's	fine. 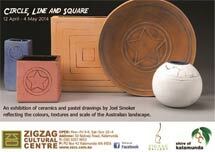 Put a drive visit to the artist studios of Mundaring in your diary now. The artists would love to meet you and share their work. Joel Smoker and the Red Dirt Band will be performing at this WAM event in historic Forrest Place in downtown Perth along with Polly Medlen and Ruby Boots. The artist’s monograph, The Kimberley Series by Joel Smoker, will be the subject of a digital presentation by Joel Smoker at the Katharine Susannah Prichard Writers Centre, 11 Old York Road, Greenmount on the evening of Saturday the 28th of November. Those interested in photography and the natural and human history of Western Australia are invited to attend. Doors open at 6.30 pm and the presentation will run from 7.00 pm to 8.00 pm after which Joel will take questions from the audience. Tea and coffee will be served with the opportunity to view and purchase the book and prints from the book. 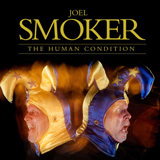 For more information please contact Katrin Kuenstler, Coordinator of the KSP Writers Centre, on 9294 1872 or by email at kspf@iinet.net.au or email Joel Smoker at joel.smoker@bigpond.com. The artist’s monograph, The Kimberley Series was launched by respected Australian landscape photographer, Richard Woldendorp at the Gallery at Ellenbrook House, 34 Main Street, Ellenbrook, on Sunday the 29th of March, 2009. The Kimberley Series of posters, metallic prints and A2 prints are also available. 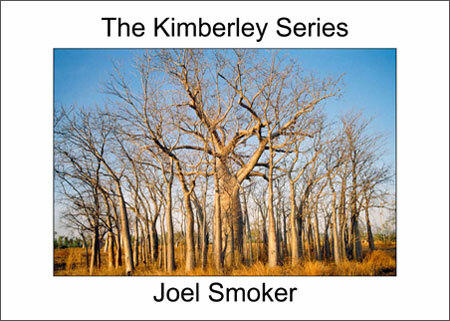 Joel Smoker's monograph The Kimberley Series is now available.